From the feedback forms from the Nov 2016 Artha event at BSE over 80% of our attendees had requested for more events themed around Applied Spirituality in Business. So here we are with our next event. 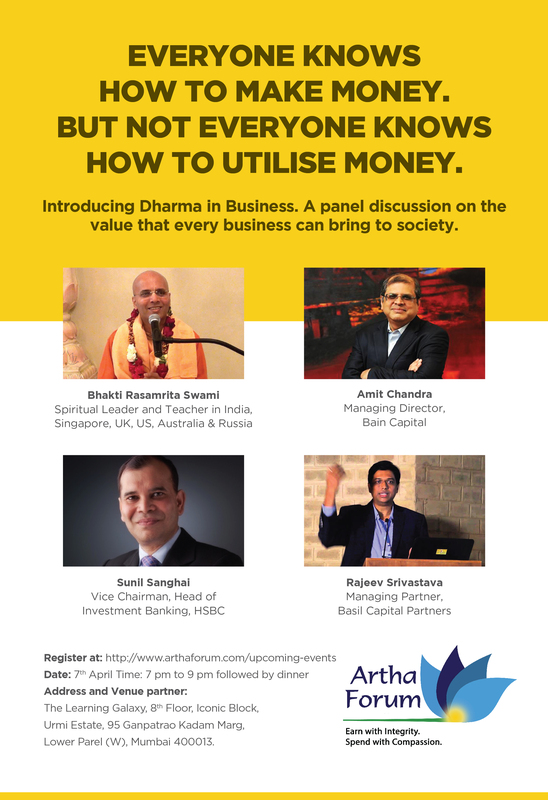 Artha Forum (www.arthaforum.com) is a community dedicated to connecting spirited entrepreneurs, professionals and bringing to them the relevance of ancient wisdom literature in contemporary business. It is an independent not-for-profit initiative and our events have encouraged several entrepreneurs to include giving back to society (10-50% ownership) as an integral part of the Business Model. Similar events at Silicon Valley, California, New Jersey, London, Dubai, Mumbai, Bengaluru & Singapore held in the recent past have received wide acclaim from the participants (Anil Agarwal – Executive Chairman, Vedanta Resources Plc, Hrishikesh Mafatlal – Chairman, Mafatlal Industries, KB Chandrashekar – Exodus Communications, Sanjay Mehrotra – CEO SanDisk, Damodar Reddy – Alliance Semiconductor, Sushant Patnaik – CMOS Inc. to name a few).